C'est une maison magnifique dans un emplacement fabuleux sur la plage. À seulement 3 pâtés de maisons de la belle plage privée avec des équipements. C'est une occasion formidable de profiter de l'une des destinations estivales les plus spectaculaires de la Nouvelle-Angleterre dans un environnement familial idéal pour rassembler tout le monde ensemble. Il y a quelque chose pour tout le monde, beaucoup à faire jour et nuit pour tous les âges. Allez dormir la nuit en écoutant le bruit des vagues depuis les fenêtres de votre chambre. L'accès aux plages avec de l'eau calme ainsi que de grandes vagues pour le surf boogie, skim boarding, body surf et même le surf réel. 1 heure et demie de Boston, 2 heures et demie de New York City, 30 minutes de Newport et Mystic, 45 minutes de Providence. 35 minutes de l'aéroport TF Green et 10 minutes de l'aéroport de Westerly. À distance de marche des plages, restaurants, boutiques, commodités et activités familiales. Faites une balade à vélo le long des routes bordant la plage jusqu'au charmant quartier de Watch Hill et prenez un verre sur le patio extérieur de l'Ocean House (à ne pas manquer). Marchez ou faites du vélo jusqu'au golf, au tennis, au terrain de basketball, aux restaurants, aux bars intérieurs et extérieurs, aux boutiques et aux activités familiales (glissade d'eau, mini golf, arcade, manège et plus). 5-30 minutes en voiture de 2 casinos (Foxwoods et Mohegan Sun), ainsi que d'autres lieux touristiques du centre-ville, y compris Watch Hill, Westerly, Stonington Borough (qui abrite de nombreux capitaines de navires du tournant du siècle) et dynamique Mystic, CT. Profitez de plus de shopping, musées, magasins d'antiquités, restaurants, bars, Mystic Seaport Museum et Aquarium, pêche, caves, promenades en ferry à Block Island et plus de golf. La maison de plus de 2500 pieds carrés a été récemment rénové et fraîchement peint avec une cuisine ouverte mise à jour avec de nouveaux armoires blanches et des comptoirs de bloc de boucher. Le plan d'étage ouvert est lumineux, spacieux et aéré avec plusieurs caractéristiques uniques, y compris une grande nouvelle terrasse arrière, arrière-cour privée, véranda, immense cheminée en granit, moulures en plâtre, planchers de bois franc partout, ventilateurs de plafond, nouvellement meublé et prêt à être apprécié! Quatre chambres ont des ventilateurs de plafond. La 5ème chambre (avec une salle de bain privée complète) a une unité de climatisation. Le 3ème étage offre un couchage supplémentaire avec 4 lits jumeaux et fenêtre ac climatiseur, un excellent endroit pour les enfants ou les adultes. Nouveaux tapis en sisal naturel, rideaux en coton blanc, nouveaux oreillers et matelas, literie en coton, carrelage en marbre au deuxième étage. Cour arrière privée dispose de 2 douches en plein air, 1/2 salle de bain, barbecue à gaz et mobilier de salon / salon extérieur. WIFI gratuit, télévision, lecteur DVD, nouveau lave-vaisselle GE et réfrigérateur GE, cafetière, grille-pain ... mais croyez-moi, vous voudrez passer la majorité de votre temps à profiter de la plage! Il y a de grandes vagues et de longues étendues de sable doux, parfaites pour marcher à n'importe quelle heure de la journée. Mots-clés: spacieuse et aérée maison de 6 chambres à Westerly Misquamicut / Watch Hill RI plage, vue sur l'eau et 3 pâtés de maisons de plage privée, et à distance de marche des restaurants, boutiques, golf, tennis, mini-golf et autres activités familiales. L'accès à 3 plages privées magnifiques avec des installations. Moins de 1/2 heure de route des casinos, du centre-ville de Mystic Seaport et de l'aquarium. 1 1/2 heures de Boston, 2 1/2 heures de New York. Écoutez l'océan depuis les fenêtres de la chambre, les commodités accessibles à pied. Belles balades à vélo, vignobles, ferries, manèges, quelque chose pour tout le monde. La maison a été récemment repeinte et rénovée. Toutes les salles de nouvelles toilettes (2010). Plomberie a été mis à jour dans toutes les salles de bains. Everyone had such a great time at the house over the weekend. I rented the house for friends to stay during my wedding weekend and when I asked what they thought the responses were a resounding "excellent." Denise was so responsive even months in advance about the property. Denise was kind enough to communicate some details to me early so that I wouldn't have to spend wedding weekend middle-manning the house information between the owner and my friends. Awesome for a big family or group of friends! Our group of 11 (4 families) had a wonderful weekend at this great home! Our sons loved the tv room and the ping pong table downstairs, along with the firepit. The kitchen/dining/living areas were so spacious. We cooked all our meals there and enjoyed just hanging out, inside and on the deck. The tables on the deck allowed our whole group to sit down together for dinner. The home has a cottage-y feel but is large and bright, with many places to sit & relax. The newer windows are terrific. The beach is an easy walk down the street. The owner contacted us when we arrived to be sure everything was satisfactory (which it was, and then some). This house feels like the summer home you wish had been in your family for generations. I live in San Diego and this property had the New England feel I was hoping for. Would love to come back! Thank You Dawn! I hope you come again! Great vacation home with an easy walk to the beach for young and young at heart! Great vacation home close to the beach and large enough to accommodate extended family. Open floor plan with lots of sleeping options. Well equipped kitchen. TV room was nice to have for kids as well as lots of toys to keep kids busy. Great back yard for kids and deck with picnic tables large enough to accommodate everyone although more umbrellas on the deck.would be a plus, as well as a few more chairs for fire pit.. Outdoor showers were well used by all. We were there during the extremely hot and humid weather (well into the 90's) so a few more floor fans to move the air would have been appreciated. Air conditioner in attic bedroom needs to be repaired or replaced. Luckily we didn't need that bedroom. A great vacation was had by all! Very quiet neighborhood and closer to beach. Ideal for large gathering with kids. What a great place! We had 10 of us in our 50's, a combination of singles and couples. I have rented several places and this is the very first that all 10 of us loved it. It is amazingly spacious on all 3 floors as well as the large comfortably furnished deck and back yard. Plenty of bathrooms!! We did a lot of our own cooking and bar-tending :-) and spent very little money beyond the food we bought. The kitchen was well appointed and had everything we needed including lots of staples available. There are 3 private beaches at the end of the road with facilities and parking. However, we all chose to hang a right and at that end of the road is a less traveled beach with a great surf! A wonderful time was had by all and we are all looking at a calendars for when we can do it all again!! PS the Denise was overly accommodating! My siblings and I stayed for a week this summer - our first time ever in RI. 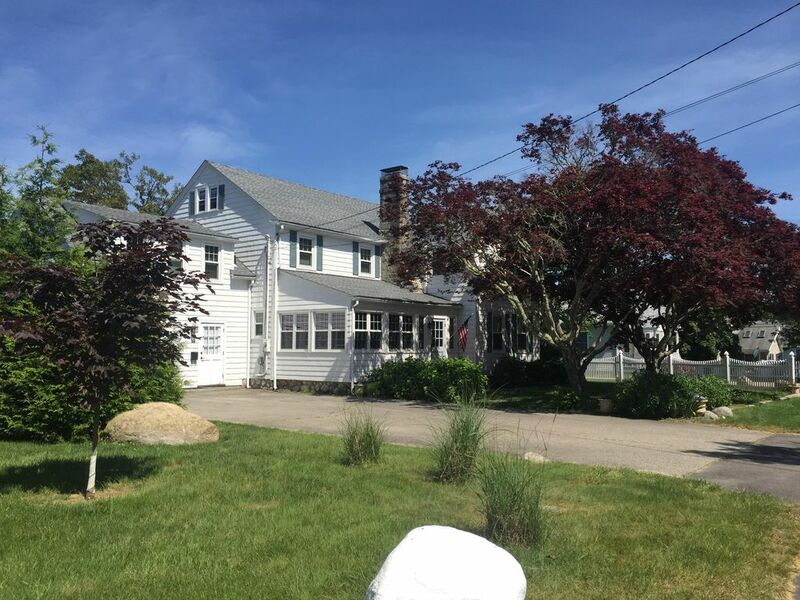 If you're considering Westerly for a vacation, I would highly recommend giving it a try, and this house is in the perfect location. We walked or rode our bikes to the beach every day, sometimes several times/day. The road is flat and wide and there isn't as much car traffic as you'd find on the Cape or in Maine. The beach was absolutely beautiful, the water was temperate enough to spend lots of time in, and we had good waves for the kids to body surf. By the end of the week we had grown fond of this house, but our first two days were nightmare. The home was not clean when we arrived despite the two cleaning people we saw there, and we spent all afternoon Saturday first going to the store to buy cleaning supplies then taking them to the house to make it livable. But the "TV" room in the converted garage couldn't be helped - it was dirty, moldy, spidery. Even the kids didn't want to sit in there. There's an old rusty refrigerator and another fridge sitting in the breezeway where you enter. Just weird. There's a ping pong table in the basement which was great, but the basement looked like something out of a horror movie. The overall feeling was that the owner bought the house to rent and doesn't particularly know or care how the property is maintained. Also, it's a very old house and so some mustiness is to be expected. But the lack of care really hit hard at the beginning because we paid so much for the week. When planning our vacation I communicated several times with Denise, who let us go into the house to look around before we committed. She was very easy to work with during the planning stages. I emailed her to specifically let her know the house didn't seem clean when we went, and also specifically asked if it was well stocked with cleaning supplies in case we had to do touch ups. She assured me it was professionally cleaned and would be spotless and that there would be plenty of supplies anyway. Neither of these statements were true. I even had to pull out all of the shelves and drawers in the main refrigerator and scrub them before we felt comfortable putting food in there. I tried to contact Denise to let her know what bad shape the house was left in, and she still has never gotten back to me. Even so this was a great house, yard, deck to spend a week in if you don't mind getting it into shape first! Our goal is for your stay to be as comfortable as possible, and we want to assure our future guests that the standards of cleanliness are always improving. Being near the beach, sand and ocean air makes their way inside, and requires management. regrettably, the guest did not alert me to her displeasures, else I would have sent my cleaning crew to return immediately. The unfinished basement and tv rec room have dehumidifiers that work in perpetuity, eliminating water out a hose into the floor drains. If they are turned on, the air quality is very comfortable in both rooms. if not, then you would notice the air quality changes. It sounds as though these were not running, nor the air conditioner in the tv room. The aged drink refrigerator has been replaced by a new one. And although the team is professional, they do prioritize their time and occasionally run out of time if guests arrive earlier than the scheduled arrival. That said, we will do everything to make your stay as comfortable as possible-just let me know what that is! Deposit: 100% refundable up to 60 days in advance of arrival date. 50% 30 days in advance, 25% 15 days in advance....and prorated to 0% on arrival date.